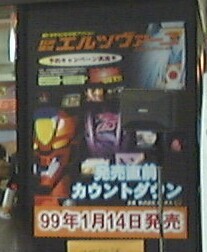 On January 9th and 10th (1999), there was an event in Akihabara for the game Eretzvaju, as it was going to go on sale 1/14. They had 6 playstations set up so people can play the game. There were also some game tournaments, with the winners getting some rare Eretzvaju goods. The area for this was pretty small. The 6 playstations took up most of the space, and if there were 3 or 4 people in line for each, it was pretty much packed. There was also a small stage. On January 10th, at 13:00 and 15:00 there was a talk show by Inoue Kikuko. They seated around 30 to 40 people on the floor inside the little area in front of the stage, and the rest of the people stood behind them. The crowd went half way into the street, and there were also some people who stood on the guard rails of the sidewalk. I stood on the outside during the first session, and sat in the third row in the second session. Each show lasted about one hour: introduction of the game (by the staff - 20 minutes), talk show by Kikuko (10 minutes), playing Eretzvaju against Kikuko (5 minutes), and the countdown battle (a game tournament with 8 people - 30 minutes). During the talk portion, Kikuko mentioned that she ate a lot of mochi during the new year holidays. She also mentioned that her daughter (Honoka) is 11 months old, and has started walking and talking. She admitted that whenever she goes to the recording studio for work, she brings an album with pictures of Honoka to show the other seiyuu. Kikuko said that she likes to do the voices of "bad" characters. (She does the voice of Ihaduruka, the female boss, in Eretzvaju.) She also mentioned that her talk CD will go on sale 1/20, and that she will have a concert tour in the spring (Tokyo, Osaka, Nagoya).